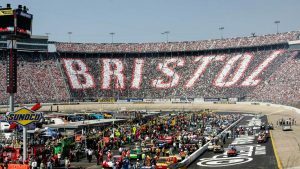 The parent company of Bristol Motor Speedway, Speedway Motorsports inc., announced a weather gurantee for buyers of reace tickets. The plan gurantee provides fans with a backup plan should a NASCAR race at on the organization’s tracks be rained out. This years Bass Pro Shops NRA Night Race is scheduled for Aug. 18 at BMS. Fans will have 60 days from the original date of a race to request a ticket credit of qualifying at a future event. If credit is received it must be used towards another Speedway Motorsports’ NASCAR event withing that calendar year of the original race. To learn more visit the Bristol Motor Speedway web page.